University secures fourth successful Regional Growth Fund allocation. South West businesses will be supported to expand thanks to £10 million of Regional Growth Fund investment secured by Plymouth University to launch a new scheme which builds on the success of the GAIN Growth Fund and a Manufacturing Investment Programme with SWMAS Ltd.
Plymouth University and SWMAS Ltd, with its bidding partner South West Water (SWW), received a £10 million grant from the £47 million of Regional Growth Fund (RGF) funding for the South West announced by Deputy Prime Minister Nick Clegg. The funding will be used to support two programmes. 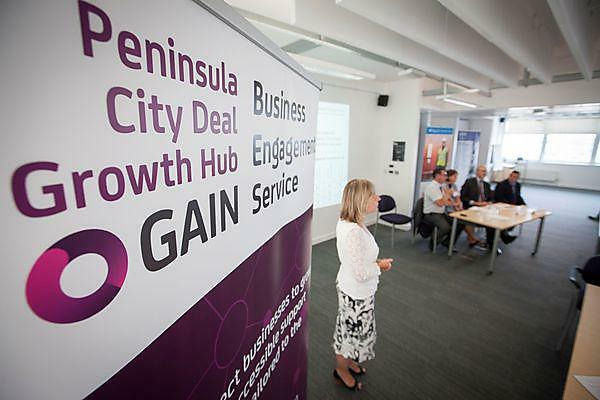 GAIN, the Growth, Acceleration and Investment Network, will use the RGF funding to develop projects to boost high quality job creation and increase private sector investment across the South West, primarily through a new programme which will build on the success of the GAIN Growth Fund and incorporate free, additional support provided by the bidding partners to maximise the impact of grant funding. The Manufacturing Investment Programme will champion manufacturing across the South West, providing manufacturers with access to funding for high-tech capital investments and training. Successful applicants will also have access to specialist technical support to help embed new technologies, maximising productivity and growth prospects. Businesses will also be able to access free resource efficiency audits provided by South West Water to help cut costs, with free water and energy checks available to help companies save money on their bills. More than 1,000 jobs have already been created in Devon, Cornwall and Somerset as a result of the £7.5 million in RGF investment initially secured by Plymouth University through GAIN, and later in partnership with the Plymouth and South West Peninsula City Deal. More than 87 businesses benefited from the first three rounds of RGF funding agreed since 2011, unlocking more than £22 million in private investment. More than a third of grants –ranging in value between £25,000 and £250,000 - went to manufacturing and engineering companies. The current GAIN Growth Fund follows the previous, highly successful Plymouth University and Western Morning News Growth Fund (PWGF) which made more than 60 grants totalling £4.7 million to South West companies in 2012/2013, supporting the creation of more than 500 new jobs and unlocking investment of over £9 million. In the latest round of the Growth Fund, 32 awards totalling £3 million were made to South West businesses eager to expand which put forward a strong case for support, unlocking £13.5 million in private investment and creating 530 new jobs. Detailed outputs of the £10 million RGF investment are still being finalised but the majority of the grant will support the new programme that builds on the success of the GAIN Growth Fund managed by Plymouth University to help support businesses to expand through targeted grants.